IT'S TIME TO START OUR LARGEST FUNDRAISER OF THE YEAR! Navesink Kares is this year's replacement to the Walkathon but there are many similarities to how they function. Same Goal: $15,000 to help our school keep being the best we can make it! Same Big Celebration: If we make the goal of $15,000 the kids get a school-wide Dance Party starring DJ Cullen attempting to learn to Floss! 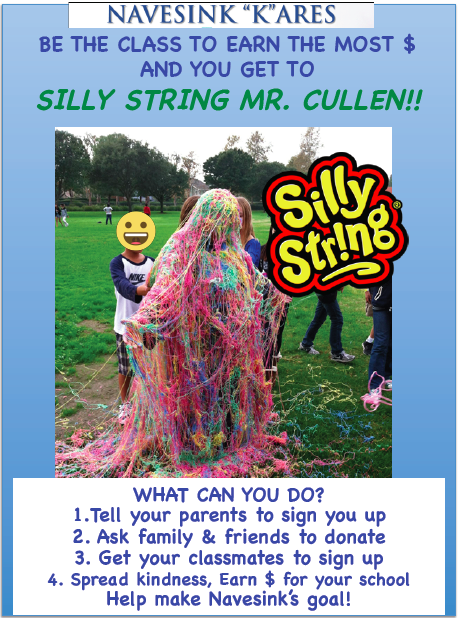 AND top earning class gets to Silly Spring Mr. Cullen! Same Easy Sign-up: Register your child below, get a link to your child's home page and share on your social media channels and via e-mail! What's Different? Instead of focusing on physical fitness with a Walkathon at the end of the fundraising event, the kids are now learning about the importance of spreading kindness. They will thank their family and friends for donations by paying the kindness forward. The donation is a set amount that is collected ahead of time and they are not tied to the actual acts. The Acts of Kindness are a way to show our donors that Navesink is committed to creating a well-rounded student. Kids can choose little or big acts of kindness to do in school, at home or in their community. Their kindness acts can be updated on their Raise Craze home page so that donors can keep up with what the kids are doing. Wall of Kindness: Teachers and Staff have colorful post-its at the ready to "catch" the kids in acts of kindness and share it for all to see at school. Check out the presentation below for more info. FIRST DEADLINE IS APRIL 1ST. SIGN-UP TODAY! WHERE DOES THE $ FROM THESE FUNDRAISERS GO?